Chris Coleman wins his heat as Malta's Jacob El Aida trails behind. Christian Coleman, the man fancied to lead sprinting into the post-Usain Bolt era, gave a glimpse of his searing ability after a brief alarm as he breezed into the 60 metres semi-finals at the world indoor championships on Saturday. 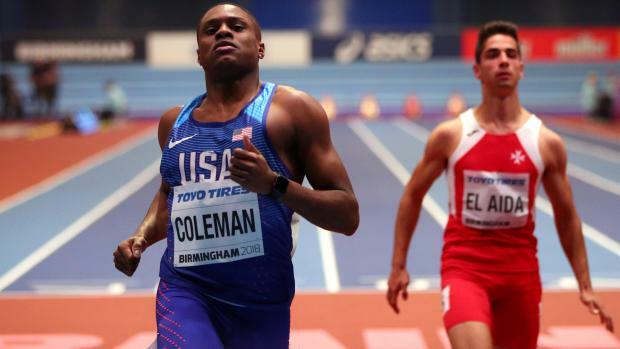 Coleman, the US sprinter who set a world record of 6.34 seconds last month, stuttered on his third stride while easing into cruise control but still had no problems as he then motored away from the field to win in a modest 6.71 seconds. "My start was decent, but I tripped," Coleman said. "But I stayed calm and made it through. I'm really excited and feel well prepared. The crowd here is great so far and I think it will be electric this evening." Thanks to his mistake, Coleman, who turns 22 on Tuesday, was only the 16th fastest qualifier for the semi-finals scheduled for the evening session before the final which is the climax of Saturday's programme. The quickest man in the heats was Coleman's U.S. team mate Ronnie Baker, who clocked 6.57, while other impressive winners were Turkey's Emre Zafer Barnes (6.58) and China's Su Bingtian (6.59). The biggest cheer in the morning session was reserved for 41-year-old former world 100m champion Kim Collins, the popular Saint Kitts & Nevis athlete who finished third in Coleman's heat in 6.77 to battle into the semis in his final competition. In a happy coincidence, Collins, the oldest man in the championships, lined up next to the youngest competitor, Malta's 16-year-old Jacob El Aida, and made light of the 25-year age gap as he beat the awe-struck youngster by 0.32 seconds. El Aida finished the race in fifth place in 7.09 seconds. He finished ahead of Czech Zdenek Stromsik (7.41) and New Zealand's Kemar Hyman who was disqualified. "I feel young but it is time to say goodbye. This is it. I can't do it any more," said Collins, who won a silver medal in the event when the championships were last staged in Birmingham 15 years ago. "The body isn't able to do what it is supposed to do. But I am going out in peace -- no low notes, no high notes. There will be no comebacks. "I keep telling the youngsters that I am old enough to be their father and that they should show me respect." El Aida certainly did that, hardly able to credit that he had been sandwiched in lane five by Collins on one side and Coleman on the other. "I saw the list of heats when I was in the stands and I didn't stop smiling for 30 minutes," beamed the man from an island that has no indoor track. "Kim is a legend – I hope I am still running when I am 41."